Potentially hazardous bacteria and viruses are killed before they have a chance to make someone sick. Your furniture will be in showroom condition because there won't be any spots or stains. There also won't be any funky odors from kids or pets. Your furniture will last up to FIVE times longer! When you get your upholstery cleaned on a regular basis, you remove the small, dry soils which act as abrasives to the fabric. If these abrasives are allowed to stay in your upholstery, just the act of sitting on the furniture can cause these abrasive soils to grind down and ruin the upholstery. You'll ultimately save money. The cost of professional carpet cleaning is a fraction of the cost to replace your furniture. You know that your carpets should be cleaned every 6-12 months. But what about your upholstery? 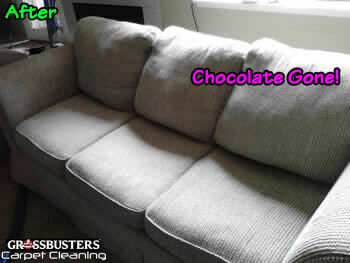 Upholstery should be cleaned every 6-12 months as well! 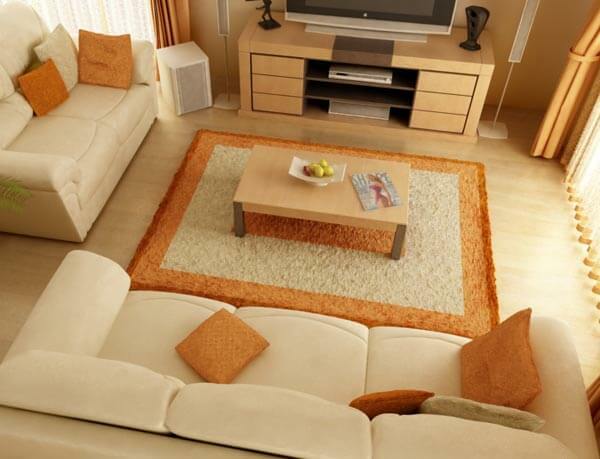 So, the next time you schedule your professional carpet cleaning, be sure to have your furniture cleaned as well. 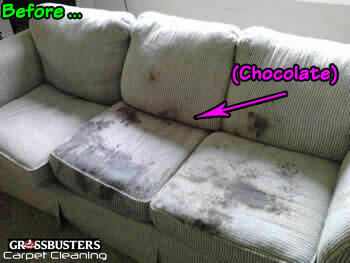 Plus, if you get all of the carpet in your home cleaned, we'll give you 20% OFF of any upholstery that you need cleaned! First, we'll look over the upholstery to identify the fiber type which will tell us which chemicals to use. We also check for any rips, tears, or severe staining which may require special attention. Second, we'll use the hose attachment on our vacuum cleaner to thoroughly vacuum each upholstered piece of furniture. We'll vacuum the cushions, the armrests, the back, the front, and even the platform above the springs. If you have pets we will focus on removing as much hair as possible. Third, we will use a fabric-appropriate pre-spray. We will always test the chemical in an inconspicuous spot to make certain that the chemical will not damage your upholstery. Fourth, we gently work the chemical in with a soft, horsehair brush by giving the upholstery a gentle scrub. Fifth, we'll allow the pre-spray to dwell for about five minutes. This dwell time is very important as it allows the pre-spray to soften up any stubborn or sticky soil on the upholstery. 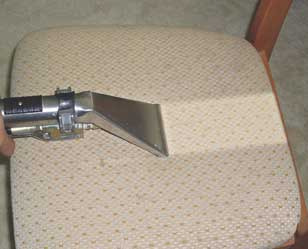 Sixth, we steam clean the upholstery with our specialized hand tool. This unique tool has its spray jet inside the vacuum chamber which prevents excessive over-spray onto your floor or other furnishings in the room. Seventh, we'll look over the upholstery once more to make sure that there are no remaining spots. If there are, we'll treat them with a fabric-appropriate spotting chemical at this time. Eighth, if you'd like Scotchgard fabric protector, Microban anti-microbial treatment, anti-allergen treatment, or deodorizer applied to your upholstery, we'll do so at this time. Ninth, we'll set up the furniture for drying. We'll stack cushions in a way that allows maximum air flow to contact each side. Usually, upholstery takes 30 minutes - 2 hours to be completely dry. For heavily soiled upholstery which required an extra deep cleaning, it may take several hours to dry.